One of the benefits of paging through old copies of the Proceedings of the Grand Lodge of Illinois is running across remarkable moments. In the 1927 edition of the Proceedings, reporting on the eighty-eighth annual meeting, the Grand Secretary announced that Brother Owen Scott was attending his fiftieth consecutive Grand Communication, an announcement, it was recorded, that “was received with great applause.” Nothing more was recorded, which is odd, since Brother Owen Scott was the Grand Secretary, and was also a Past Grand Master. Owen Scott was born on July 6, 1848, on a farm in Effingham County, Illinois, and remained a central Illinois resident for the rest of his life. A teacher, attorney, and newspaperman, he served as superintendent of schools for Effingham County from 1873 to 1881, published the Effingham Democrat, and served as Mayor of Effingham in 1882, and City Attorney in 1883 and 1884. After moving to Bloomington, Illinois, in 1884, he continued in the newspaper trade, publishing the Bloomington Daily and Weekly Bulletins. 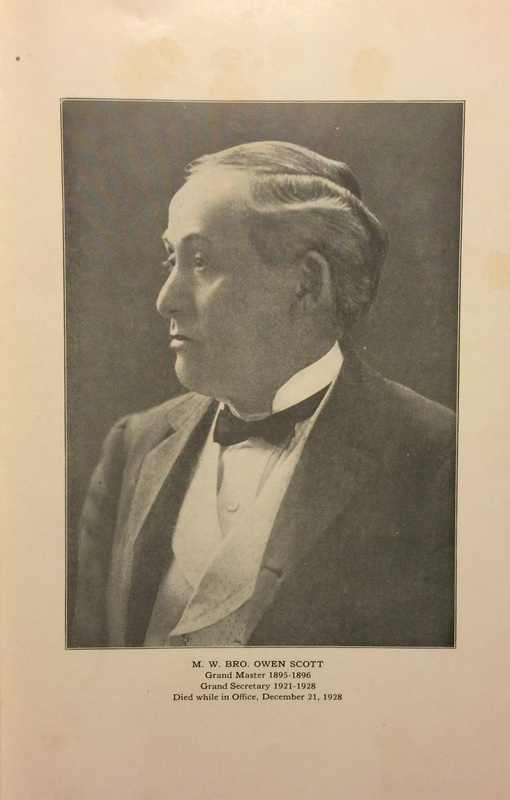 Elected to Congress in 1890, he served one term, and in 1899 moved to Decatur, Illinois, where he managed the Decatur Herald, before going into the insurance business in 1904, from which he retired in 1921. His Masonic career was equally peripatetic and even more distinguished. He was initiated on December 17, 1870, passed on January 21, 1871, and raised on February 28, 1871, at Watson Lodge No. 602, in Watson, Illinois. He affiliated by demit to Effingham Lodge No. 149 in 1873, then by demit to Wade Barney Lodge no. 512 in 1885, and then by demit to Macon Lodge No. 8, in Decatur, in 1903; he remained a member of Macon No. 8 for the rest of his life. He was elected Junior Grand Warden in 1889, and Grand Master in 1895. After his time in the Grand East, he continued to serve the Grand Lodge on several committees, before being elected Grand Secretary in 1921. He died in office on December 21, 1928, having attended fifty-one consecutive Grand Communications. Which brings us back to his announcement in 1927. Becoming a Grand Officer of any kind is a remarkable achievement, and to be both Grand Master and Grand Secretary is truly notable, but Brother Owen Scott thought it important to announce his fifty years at Grand Lodge, as if it were more worthy of special mention than his other accomplishments. And perhaps it was. His fidelity to his trust, his constancy, and his willingness to serve were all inherent in his traveling year after year to Chicago in service the Fraternity. And he was not—is not—alone. Perhaps he was more distinguished than most Brethren who continue to serve Freemasonry, and perhaps he was fortunate in being able to attend without fail, but there have been and still are other Brethren who make the trek year after year, serving Freemasonry with their time and fidelity. Like Most Worshipful Brother Owen Scott, they are worthy of admiration and emulation, not just for their work, but for their constancy. They are the Masons who continue to show up to degrees, to work the pancake breakfasts, to help with roadside cleanup, who attend schools of instruction, and who cycle through the chairs over a long Masonic life. They’re the ones who can be counted on. Like Brother Owen Scott, they serve. Like him, they deserve our thanks.